Great business leaders possess more than celebrated traits like charisma and an appetite for risk. They have "contextual intelligence"--a profound ability to understand the Zeitgeist of their times and harness it to create successful organizations. 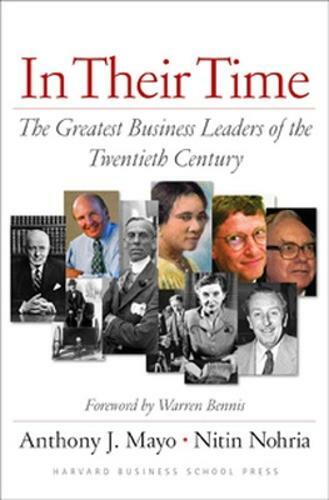 Based on a comprehensive Harvard Business School Leadership Initiative study, Anthony J. Mayo and Nitin Nohria present a fascinating collection of stories of the 20th century's greatest leaders, from unsung heroes to legends like Sam Walton and Bill Gates. The book identifies three distinct paths these individuals followed to greatness: entrepreneurial innovation, savvy management, and transformational leadership. Through engaging stories of leaders in each category, the authors show how, by "reading" the context they operated in and embracing the opportunities their times presented, these individuals created, grew, or revitalized outstanding American enterprises. A canon of leadership success from the last century, In Their Time reveals insights for contemporary leaders hoping to build lasting legacies.